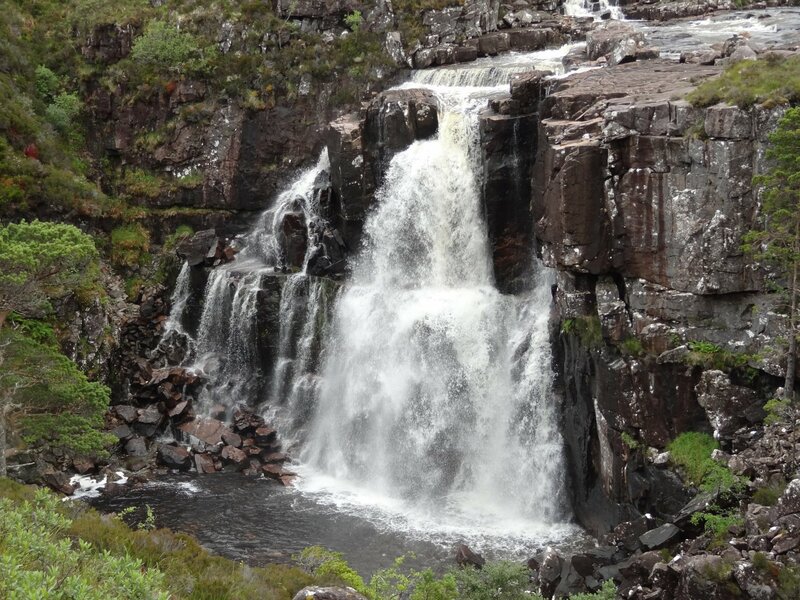 We first read about the Talladale falls in Richard Gilbert's book, "Exploring the far north west of Scotland" (Cordee Press, 1994). 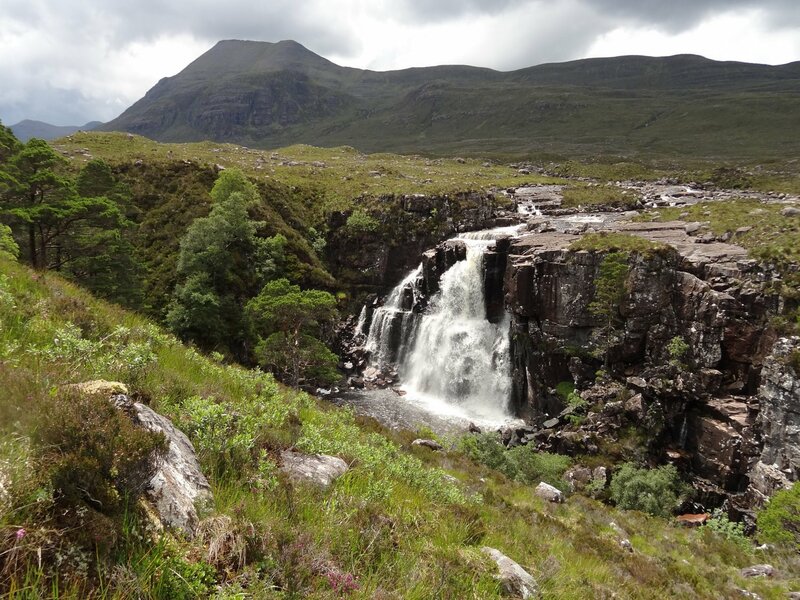 He visits the falls as part of a walk over Beinn A'Chearcaill, starting up the Grudie from the Loch Maree road, and coming back down Talladale. 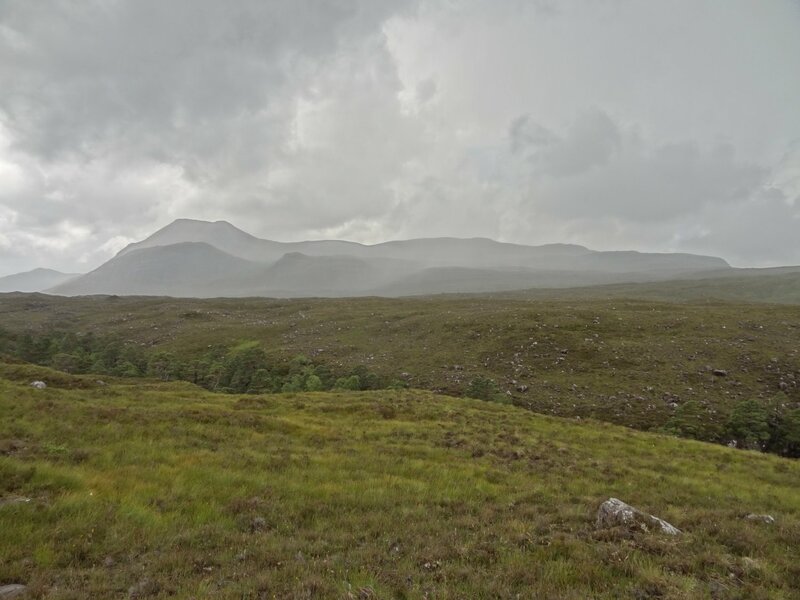 In the book, he writes with great enthusiasm about this area, about Coigach, Assynt, the far north, and much of the most amazing scenery north of the Great Glen. 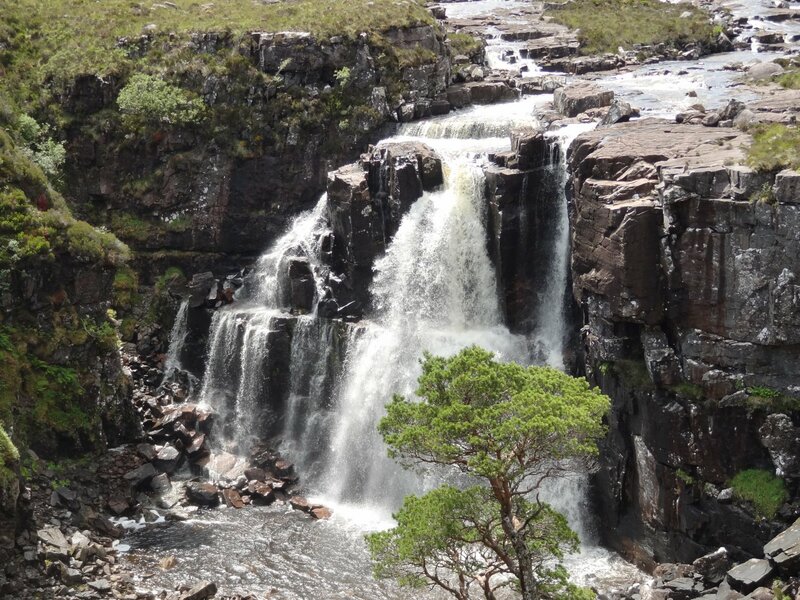 He says that the Talladale falls are "probably not surpassed by anything in this guidebook... It is the climax to the day, yet gets no mention in any other book I have read." This of course captured our imaginations. It's now about 16 years since we first read about the falls. Since then, we've had many holidays in the northwest Highlands, and have read many books, leaflets, and talked to many people locally. It wasn't until we finally got around to staying at Talladale this summer (2011), that we found anyone who knew anything about the falls, and saw them ourselves. 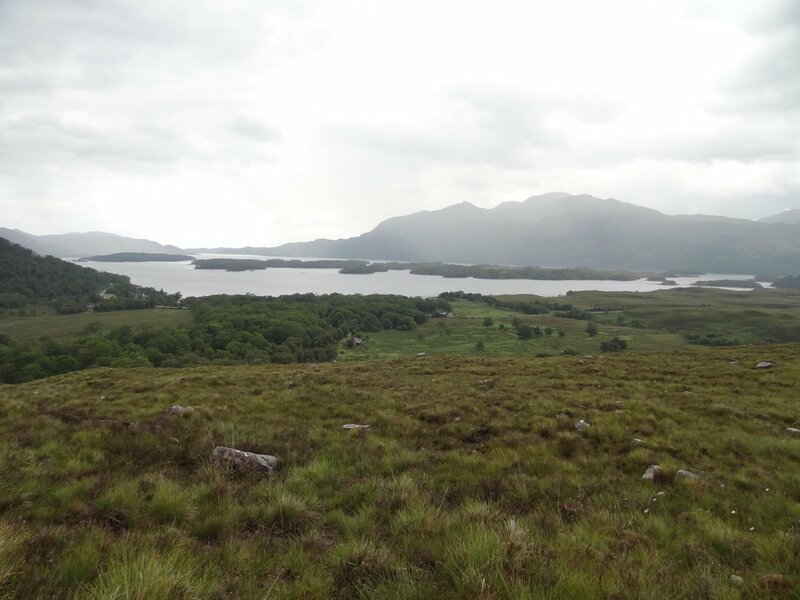 We stayed with Nick Hardy-Thompson at the log cabin by the Loch Maree hotel. Nick was a great host, and we felt extremely comfortable there; of course it's also a fantastic base for walks and cycle-rides, and boat trips on the Loch: indeed, the ride from Achanalt station to Talladale - or even just the bit along the Loch, was already enough to make it worth the journey from Yorkshire. When we booked, Nick told us that the Grudie-Talladale hydro scheme had been revived, and looked like it was going to go through this time. Richard Gilbert's book, mentioned the then recent demise of a similar scheme there, citing a conservation campaign. Just before our visit, a quick websearch did find some information, e.g. the Mountaineering Council of Scotland's response to the latest plans. 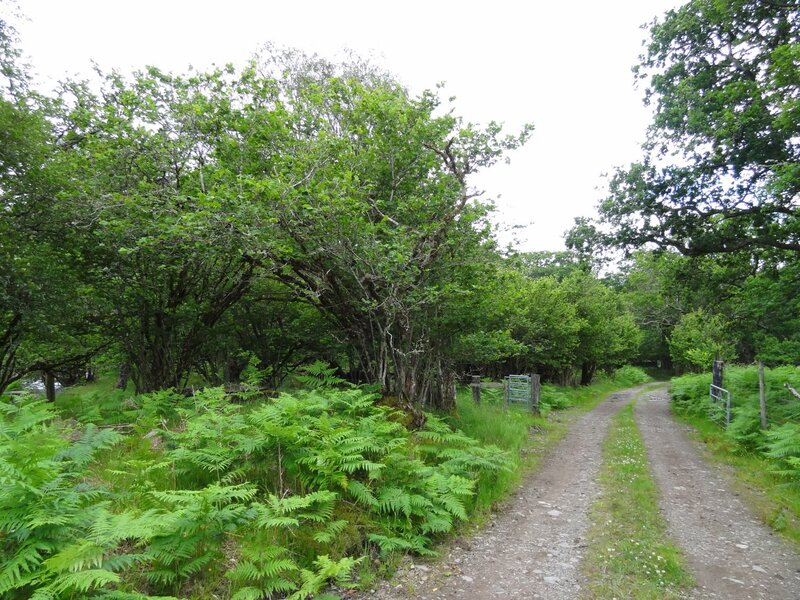 When we got there, however, it seemed that local people hadn't been consulted about the plans. Richard Gilbert also comments that it's tough going to get there, without any vestige of a path. This is still true, although it's been a pretty dry year so we might have had an easier time of it than normal. We set off from the hotel, and up the short farm track that follows the east bank of the river Talladale. When that finished, we were soon on the open hill, as part of a grand day out, essentially doing Gilbert's walk in reverse, although, in a rather roundabout and snaily way, with lots of lingering. Please click on [Talladale → Grudie] for photos from the rest of this walk. It's worth looking back of course, particularly if going on and returning to Talladale by a different route. It's often worth pausing to look back on any walk! 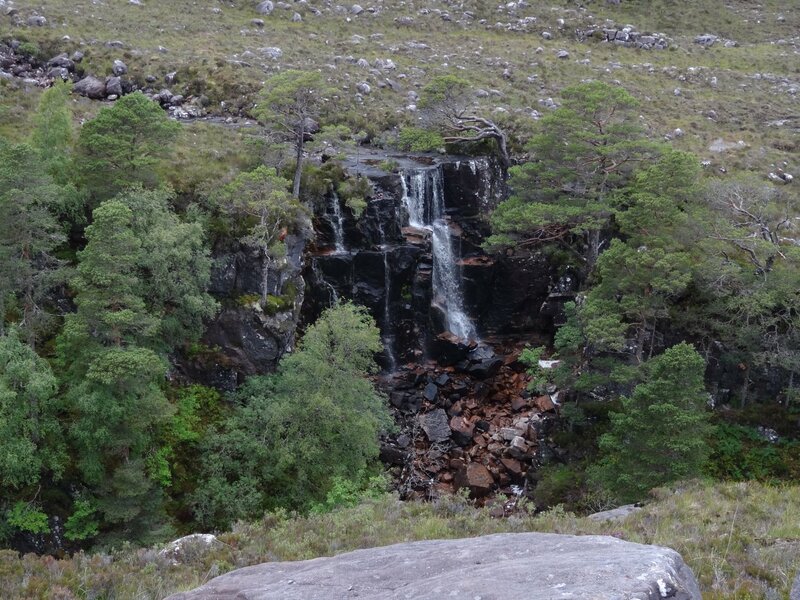 So before we get near the main falls, here's a quick taste of the downstream aspects. The track from the road follows the river, audible and glimpse-able through the trees, which include an old stand of coppiced hazel. 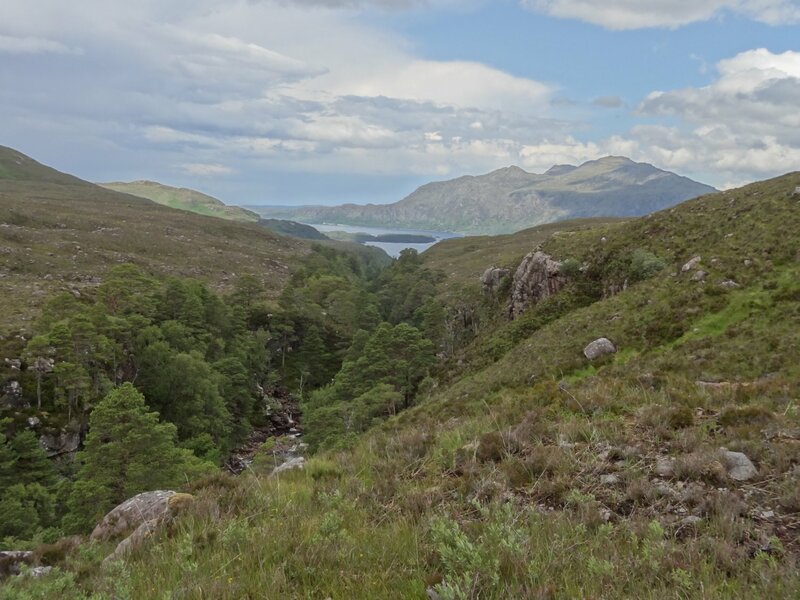 The views across Loch Maree soon open out. 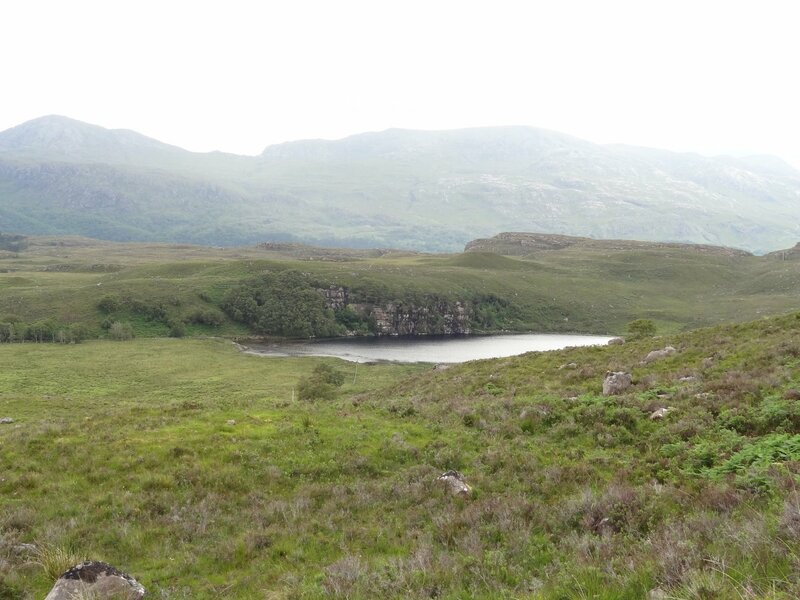 Loch na Fideil looks quite wild from above - one can well see why Brenda Macrow, in her book "Torridon Highlands" (Robert Hale Ltd., 1953), said it has the character of a hill loch even though it is so close to the road (and to sea level!). 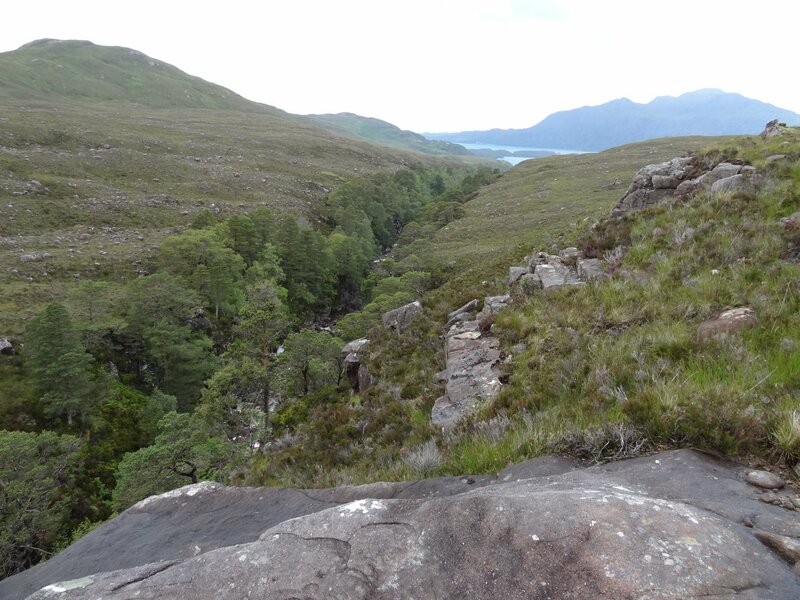 Later, Loch Maree recedes somewhat, and the long, comparatively straight course of the gorge starts to impress. As you get close to the falls, you can see the now-dry continuation of the gorge, still straight (shown here looking back), in contrast to the main falls which enter the gorge more or less at a right angle. As the top of the gorge comes into view, the skyline suggests that the setting could be quite spectacular. 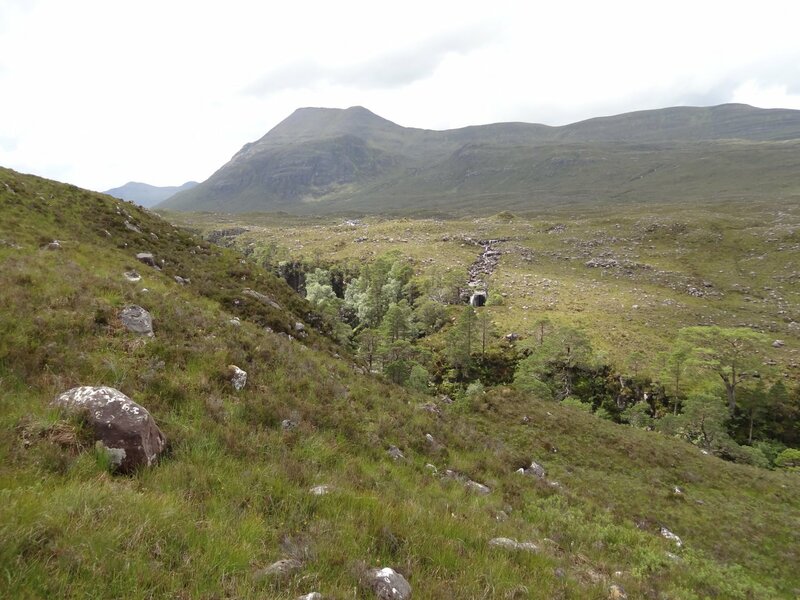 The full length of Beinn an Eoin is well highlighted from lower down. The first waterfalls you see, probably from a fair distance, are not the main ones: we were walking a little way from the edge of the gorge, as it's a bit less up/down there. 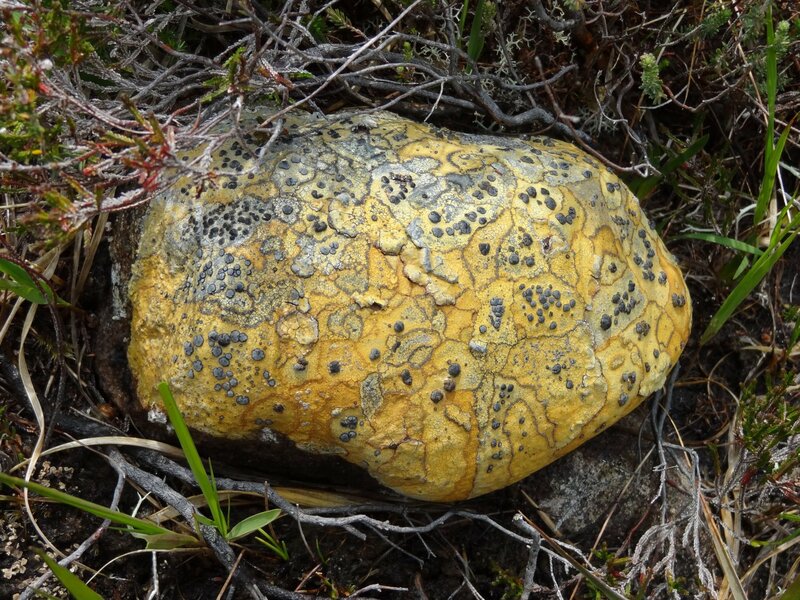 They are nevertheless quite pretty, showing well the difference between different sorts of wear on the rock, and it's worth going across for a closer look. 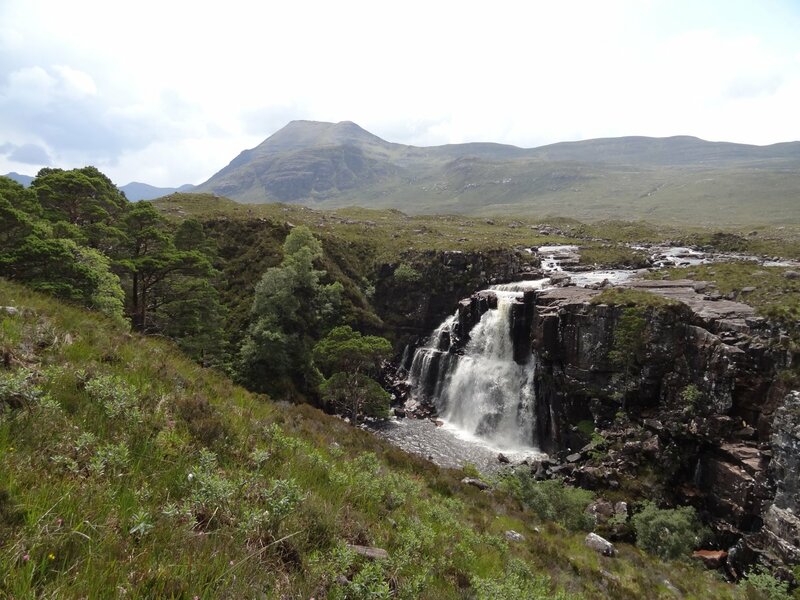 The first view of the main falls is an oblique one, with the skyline ahead still demanding attention: nearby the west end of Beinn A'Chearcaill on the left and the south end of Beinn an Eoin are prominent, framing the more distant but exciting outlines of Liathach (left), and Beinn Dearg (centre) The overhang of rock on the north border of the falls might catch your eye as much as the falls at this point. 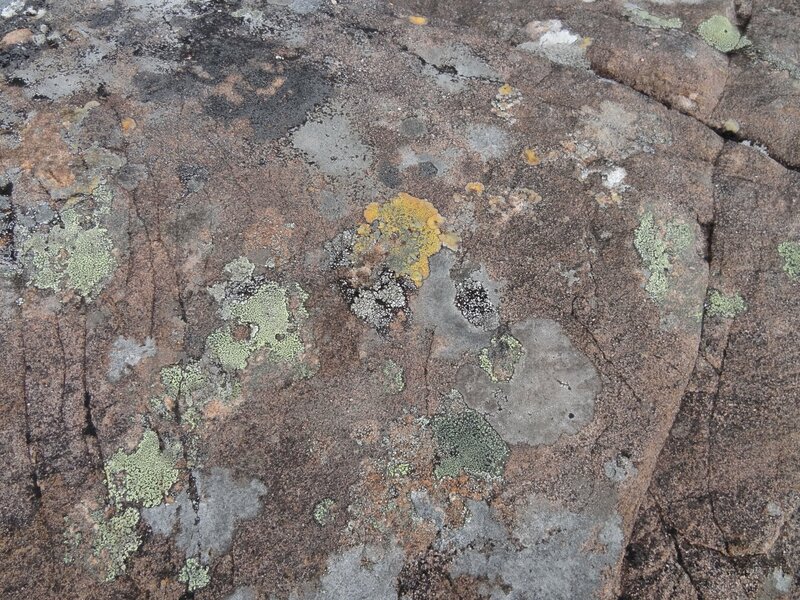 The rock here is classic-coloured Torridonian, and the lichens are, as ever, a delight. 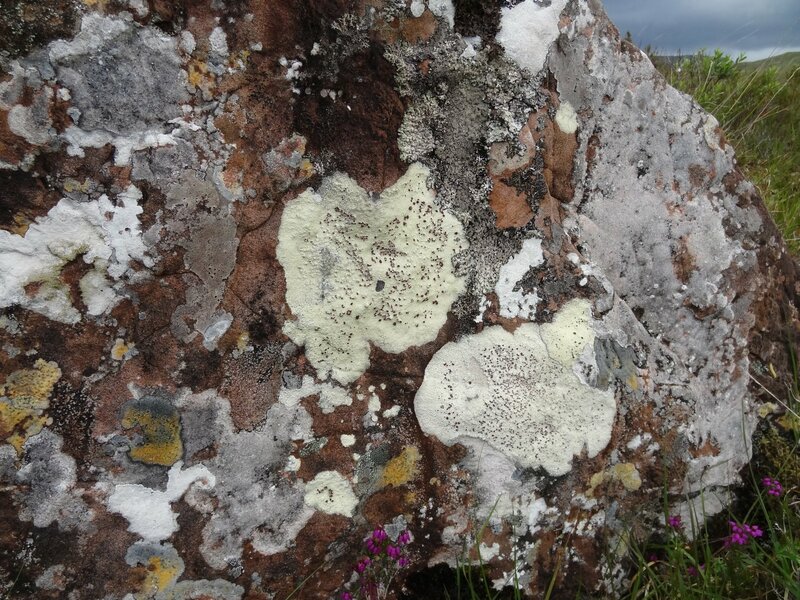 The last of these photos shows growth rings in the lichen - something we've not seen much before. Growth rings (?) 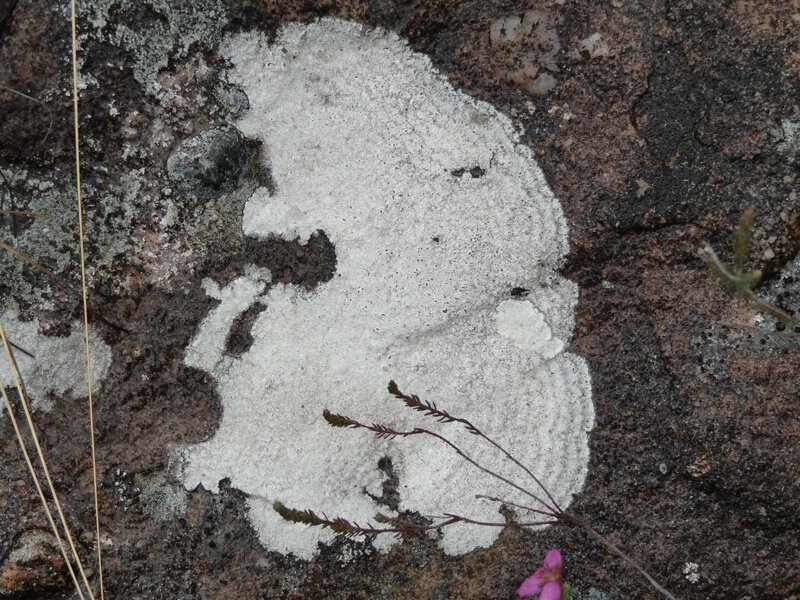 in lichen, also on the way to the falls. Finally, here are some more views of the main falls. Looking down on the gorge by the falls, we saw a lot of birds: a pair of siskins and a pair of bullfinches flew downstream below us - interesting to get a bird's-eye view of them! We hope you've enjoyed this little page. 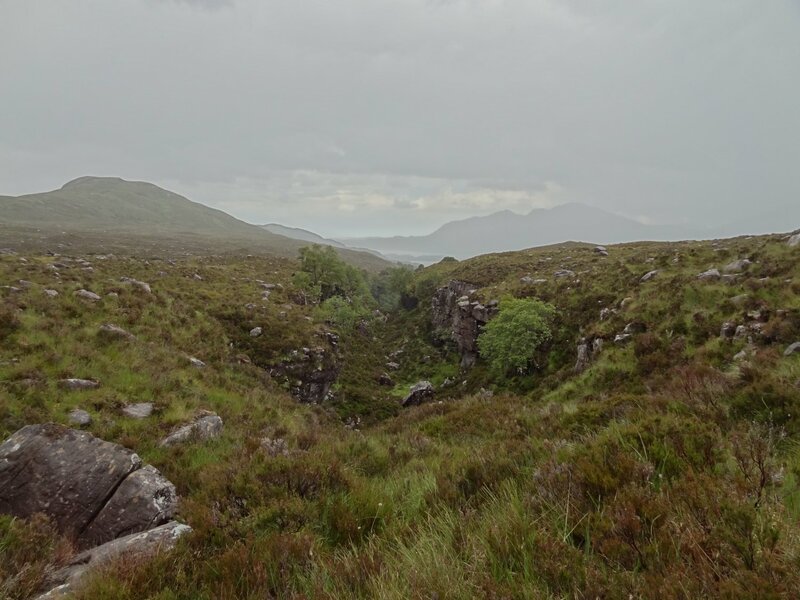 If you'd like to see what the rest of the walk was like - over Beinn A'Cheircaill and down Glen Grudie, please click on [Talladale → Grudie]. The Talladale falls might soon become much more accessible, via construction tracks for the Talladale-Grudie hydro-electric scheme. 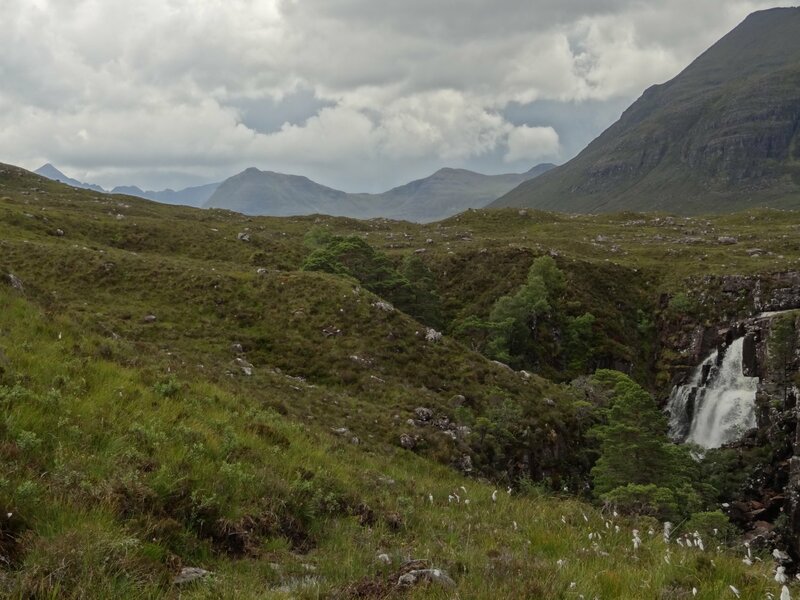 The same tracks would probably considerably alter the character and appearance of the area round the falls, and possibly of the falls themselves. It seems that the falls have always been shy: while staying at Talladale, we cycled to Gairloch and visited the excellent museum there, where we bought the new reprint of J.H.Dixon's classic account of the Gairloch parish, published in 1886 - probably the most detailed book available. On a quick scan of the relevant parts of the book, it appears that he doesn't mention the falls either. 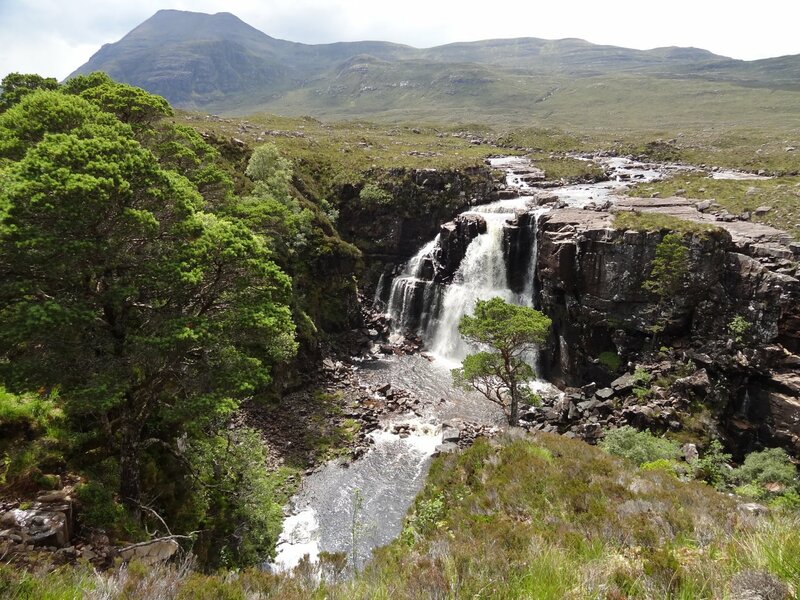 If the hydro scheme goes ahead, the falls' history as a secret part of the Wester Ross wilderness would thus come to an inconspicuous end. This may not be the place to debate the rights and wrongs of it. There's generally greater emphasis on sustainability now than there was in the 1980s, when the original scheme was rejected. This is undoubtedly a good thing, and we have been trying to put our money where our mouth is over this: walking/cycling to work every day, saving water, using public transport rather than driving, etc. etc., for the last 20 years. Does the supreme importance of sustainability mean that any piece of land can be used for (comparatively) clean energy generation, regardless of the costs to wildlife, scenery, etc.? 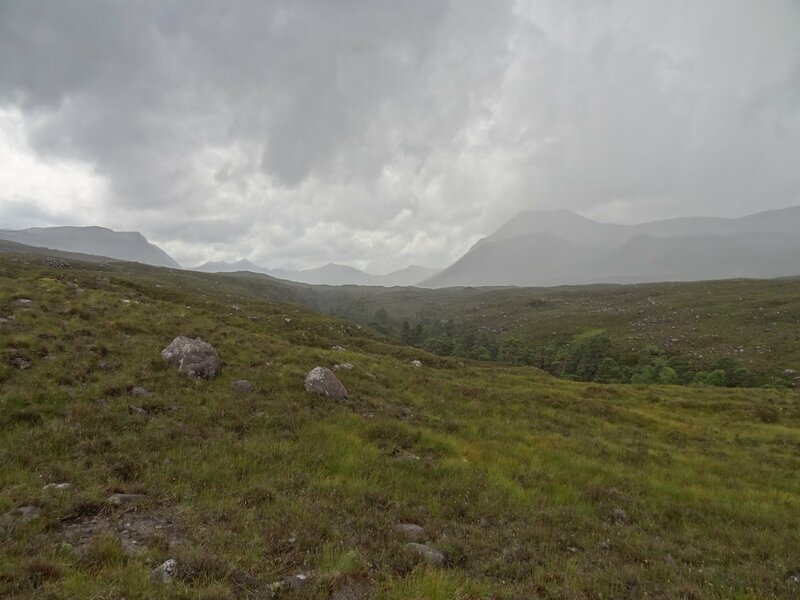 Will in fact this development make a fine and virtually unknown feature of the Wester Ross landscape more accessible, to the possible benefit of many, or will it ruin it? What value wilderness?